With 1/4 inch screw thread, compatible with most of cameras, GoPro, DSLR, camcorder and smartphone holder, also for suitable stabilizers of ZHIYUN, FEIYU, HOHEM, DJI. 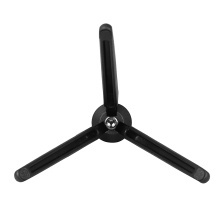 Can be used as a desktop level tripod, also can be used as a handheld stabilizer, provides a compact and secure platform for shooting. The max. load capacity is about 3kg/6.6Lbs, can hold most of photographic equipment, so practical. The folded length 13.2cm ,net weight only 80g, lightweight and portable, suitable for carrying outdoor. Made of premium aluminium alloy material, with non-slip foot mat, durable and stable. Suitable: For GoPro, camera, DSLR, camcorder, smartphone holder, stabilizers of Zhiyun,MOZA and DJI,etc. Only the tripod is included.